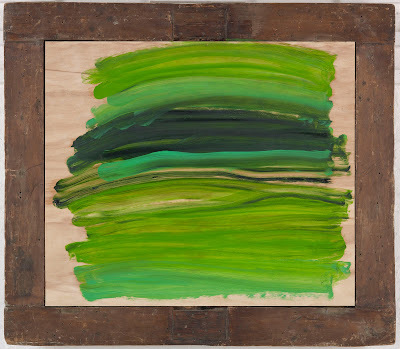 This summer, Modern Art Oxford hosts Time and Place, Howard Hodgkin’s newest exhibition, curated by Director Michael Stanley. It presents twenty-five abstract paintings realized over the last decade. 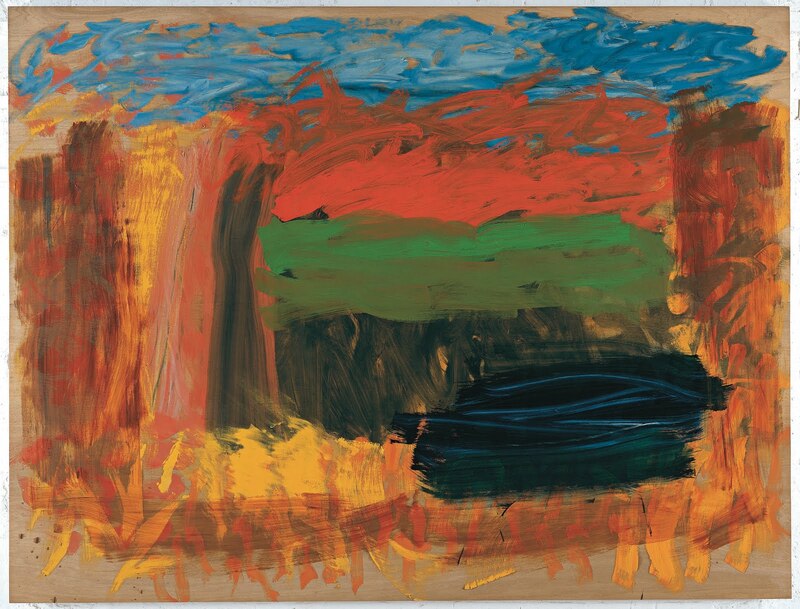 Hodgkin’s is a long and distinguished career: his first solo-shows date back to the 1960s, he won the Turner Prize in 1989 and – having exhibited in some of the major contemporary art institutions – he is recognized as one of the living masters of abstraction. With this show he comes back to the place where in 1976 an important survey was first dedicated to his work (Forty-five paintings 1949-1975). Hodgkin’s paintings explore new directions and are new to the broad public: he is back in Oxford to take stock one more time. The works on display engage with landscape and natural elements, in contrast to Hodgkin’s earlier paintings, concentrated on portraiture and interiors. 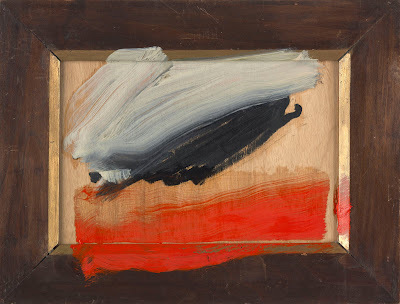 However they reveal many of the usual elements of Hodgkin’s style and practice: highly evocative colours, an emotional treatment of light, use of wooden surfaces instead of canvases, and a rigid compositional structure, often dictated by frame-like signs encompassing the central part of the picture. Hodgkin is an atmosphere painter, a Turner of our times, with an exquisite sensitivity for colour and light-properties, and the ability to make his viewers resonate with his palette, evoking various nuances of feelings. This is certainly true of the paintings in the Oxford exhibition. The aspect that struck me most was the way the pictorial elements acted on the picture’s surface. In Mud (2002) for instance I could see the brown brushstrokes in the middle of the picture just like mud smeared on its surface. It was as if the picture were saying “this looks like what mud does to the grass”, rather than “this looks like mud on the grass”. In Spring Rain (2000-2002) the centre of the picture is dominated by a heavy dark blue splash of colour that pushes a green area towards the left margin of the picture: it was like watching water rapidly accumulating on the ground, filling all the space. Again, at the centre of my attention was the event of the rain, rather than some – no matter how abstracted – depiction of rain falling on a green field. Time and Place came to sound a most appropriate title for the exhibition: events take place in a certain place and at a certain time, a view of a certain scene is frozen in a perpetual present where nothing happens. There are four big paintings beautifully assembled in the airy and luminous space on the upper floor: the biggest Hodgkin has yet painted. Their titles are taken from the chorus of the American popular song Home, Home on the Range, a musical cliché of the American West. Their scale also evokes the States: it brings to mind many famous episodes in American abstract painting. This is a great shift for an artist who has always stressed his link to classical European easel painting: the broad frame-like brushstrokes on the margins of the pictures and the overlapping planes suggesting depth and temporal continuity are some of the very typical elements that figure in many of Hodgkin’s abstracts. In contrast, two of the four big paintings in Oxford (Where Seldom is Heard a Discouraging Word and And the Skies Are Not Cloudy All Day, 2007-2008) dispense of the frame-like element and hardly evoke any scene or landscape. The other two (Home, Home on the Range, Where the Deer and the Antelope Play, 2001-2007) are inspired by the landscapes of the American West, but have an epic character, totally new in a rather intimate painter like Hodgkin. All we can see is huge and vividly coloured brushstrokes, suggesting the width of the scene, and dramatic clashes of colours, recreating a very brightly lit environment. The concentration on the way a certain scene affects the viewer, rather than on how it looks is the element of continuity with previous work. My impression is that instead of depicting, or suggesting, elements typical of a certain place, Hodgkin sought to isolate some elements of the place itself (for example its width and luminosity) and tried to recreate with pictorial means the effect they have on human beings. Hodgkin’s is an art that explores emotional reactions. It is unlikely that one remains indifferent to these paintings: the painter knows very well which strings to touch in the viewer. Sometimes the paintings play with colouristic effects so obviously that I suspect they might just be a skilfully devised mechanism to evoke specific reactions. Nevertheless irritation is replaced by admiration when I realise how much effort and knowledge it must take to produce works both very intimate and universal. © Howard Hodgkin. Courtesy of Gagosian Gallery. Photo credit: Prudence Cuming Associates Ltd. If someone were to be bleak, they would say some of these paintings look like someone was trying to get rid off excess pain from a brush on to a block of wood. For example snow cloud and big lawn look as though 30 seconds of effort has been put in to these and could have been achieved from very little talent or technique. Next time you want to fill an art gallery you should take the time to collect pieces of art rather than put a bloke next to a conveyor belt, hand him a brush and pass blocks of wood under him while he does a days work brushing away. In my opinion I think this is just a waste of paint. A waste of paint to some —magnificent perfection to me. Wholeheartedly, I concur that Hodgkin truly is one of the living masters of abstraction. His work astonishingly consistant in its impeccable grip. Very informative blog, it is very nice and expressive information shared here.